Since the dark day when Our Lord hung upon the cross, countless generations have told the story and honored the day of his dying. Because the love of Jesus transcends the boundaries of time and space. 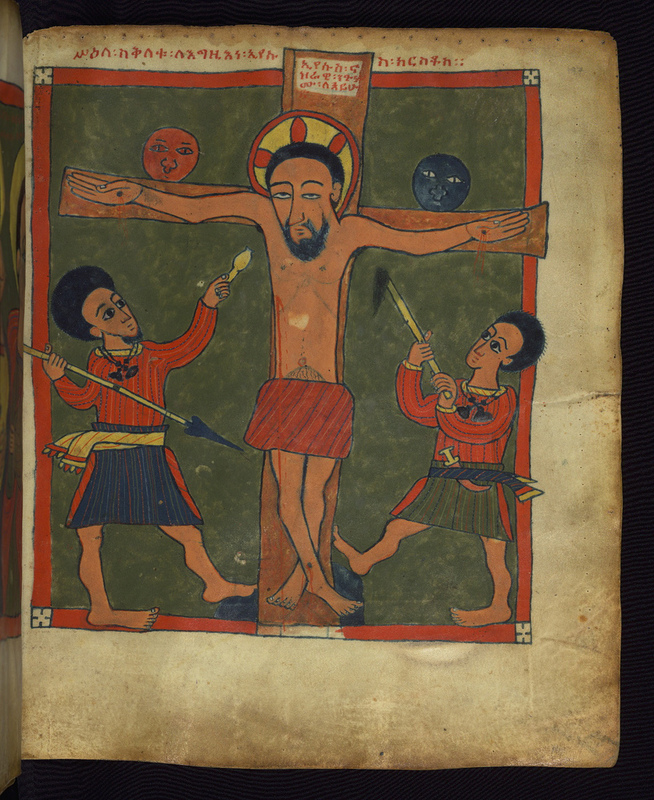 Five hundred years ago, a monk of Gunda Gunde made this illustration to include in a hand-written copy of the Holy Gospels. He worked in a remote monastery in the Tigray Region of Ethiopia, a country I have never seen. But even across five centuries, one large ocean, and parts of two continents, I can tell we follow the same Lord. I started with the good will of the Father and the Son and the Holy Spirit, And I proceeded with the intercession of Our Lady Mary, . . . This book, the book of the nativity of Christ from the womb, And the book of his circumcision without being touched, And the book of his baptism in the hand of John with the water of Jordan, . . . That you [God?] have me copied in diligence and trust… For the memory of women and children, And also the big and small (i.e. the old and the young). The people Christ draws to Himself include the transcriber of this Gospel Book. They include you. They include me. Christ draws us because of His great love for us. We don’t have to earn it. We can never deserve it. It is freely offered and freely given. Today my family, along with fellow disciples all around the globe, takes our place among the generations which honor the day of Christ’s dying. He gives us His life. May our lives give Him glory. Thank you for this beautiful reflection. I read the story from ERD today about how people tend to avoid this service. I am so happy I am sitting here waiting for our service to start. Thank You.